Get dirt, mud, and whatever else off your boots and shoes BEFORE you step inside. NOTE: mounting screws not included. 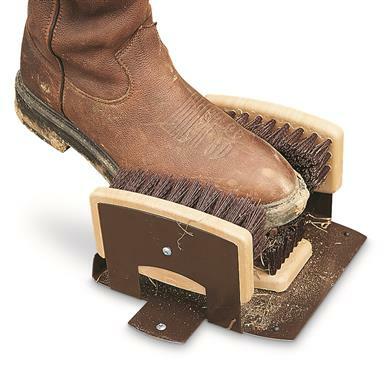 Keep boots (and floors) clean! Order today! Boot Shoe Brush is rated 4.7 out of 5 by 181. Rated 5 out of 5 by Allison from Worth every penny! We have Florida weather, rain and plenty of mud. We use this every day, several times a day taking the rescues out. Works perfectly! This is our second purchase since we wore the first one out after a couple years. Rated 4 out of 5 by PD GEM from Good product at a very reasonable price. The bristles in these brushes are mounted is a plastic like material not wood as most. The bristles are good and stiff and do not shed. Brushes are mounted on a coated metal base and has with stood several months of heavy use without chipping, rusting or shedding bristles. Rated 5 out of 5 by Chuck from Price was good. I am very pleased with the boot scraper. my problem is where to mount it to keep from dragging dirt into the house. It works well as I temorarily mounted it to try it out. I can recommend it, no hesitation. Rated 5 out of 5 by Boss from Good product, good price and very good service!